A multidisciplinary model of economics provides a philosophical and practical approach that integrates epistemology, anthropology, and the ethical domains of economics into a more meaningful concept of “integral human development” as understood by Pope Benedict XVI in his encyclical letter, Caritas in Veritate. The last financial crisis is an incredible opportunity to rethink the ways we teach economics, allowing for the creation of a multidisciplinary framework that will enhance the contributions made by economics in regard to understanding the individual’s decision-making process. It is claimed that the interaction and synergy between economics, the natural and the social sciences will enable a more accurate description of the complex reality which constitutes the truth in economics. 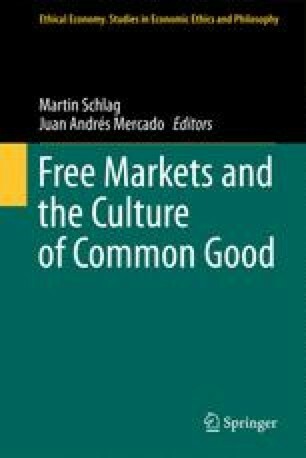 This chapter argues that the role of the university is essential in creating spaces for ideas to find the truth, that is, logos which creates dia-logos, and hence communication and communion (Benedict XVI 2009, 4) between economics and other social sciences. Engel, George L. 1977. “The Need for a New Medical Model: A Challenge for Biomedicine.” Science 196:129–136. ISSN 0036–8075 (print)/ISSN 1095–9203 (web) doi: 10.1126/science.